The 40th anniversary season of Telekom Veszprém HC, which started with the successful Veszprém Handball Festival, shall be a milestone and a benchmark – with a new coach: Ljubomir Vranjes, and an old goal: winning the VELUX EHF Champions League. But the preparation was overshadowed by negative headlines about Aron Palmarsson, who will not be part of the squad anymore. Though Peter Gulyas and Gergö Ivancsik ended their active careers, they remain part of Veszprém’s youth programme. 11 players, the coach and his assistant left. A new coaching duo and five players arrived. Can Ljubomir Vranjes immediately fulfil all hopes? It will a process of mutual learning and understanding. In the preparation, Vranjes said that he knows Veszprém perfectly – but from the perspective of an opponent. Now he is assuming internal views. 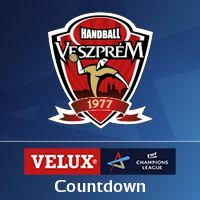 The process of transition is made easier by the fact that Veszprém can focus on the Hungarian league and VELUX EHF Champions League only, and will not play in the SEHA League. The squad has been reduced, the focus has been set on Champions League – but the new construct definitely needs some time. What was the reason for Palmarsson’s departure – and how will Veszprém cope with the situation? Aron Palmarsson has signed a contract with FC Barcelona, starting in 2018, but wanted to join the Catalan team this summer. When the first of Veszprém’s training sessions for the 2017/18 season was about to start, Palmarsson informed his new coach Vranjes that he was in Iceland, after which the club decided to suspend him from the squad. Now Vranjes counts on Mate Lekai and Matyas Györi as playmakers. Next season (and not earlier) French world champion Kentin Mahe will join Veszprém. After four straight times in Cologne, can Veszprém make it to the VELUX EHF FINAL4 again? Flensburg, Kiel and PSG were also Veszprém’s group phase opponents in 2016/17, while this season, Kielce replace Barcelona. Veszprém are therefore expected to finish among the top three or four in Group B. The chances of making it to Cologne are the same as in the last seasons – it depends on luck, injuries, and how fast the coach and team will fit. The past has shown that if you make it to Cologne, anything can happen. Veszprém definitely belong to the top favourites again in 2017/18. After 11 years with Flensburg, the Swede takes a new challenge in double function, as he will also coach the Hungarian national team in tandem. Vranjes has been awaited, after he steered the Flensburg underdogs to the Champions League trophy in 2014. He will have tactical and conceptual freedom at Veszprém – if he is successful. The main problem can be the burden of both coaching jobs, though a number of Hungarian internationals are playing for Veszprém. Vranjes will definitely add fresh blood and ideas, and the style of play will be different from the Spanish way of Javier Sabaté. The first conclusions can be drawn on May 27, 2018. The main goal is qualifying for the VELUX EHF FINAL4, say sports director Nikola Eklemovic and team captain Laszlo Nagy with one voice. “The biggest wish for the players, club and the fans is obviously winning the Champions League. This is a hard group but I think it is better to have stronger opponents now in group phase, because then maybe you can get easier opponents in the knock-out period,” adds Eklemovic. For Nagy, the Champions League is “the biggest international cup”, and Eklemovic agrees that the highest level of handball and atmosphere is seen at the VELUX EHF FINAL4. In 40 years, Veszprém claimed 51 domestic trophies in Hungary, becoming national champions 25 times and Cup winners 26 times. The first title dates to 1984, three years after the club was promoted to the first league. On home turf this season, the well-balanced side of Pick Szeged will be eager to take at least one domestic trophy from the arch-rivals. It is not Kiel, it is not Barcelona, it is Veszprém! The Hungarian record champions are the only club that was part of all four VELUX EHF FINAL4 events since 2014. Unfortunately for Veszprém, they never won the trophy despite being finalists in Cologne twice. In 2016, they made unlucky history, letting a nine-goal lead slip in the final against Kielce. Aside from coach Vranjes (Flensburg 2014), four current Veszprém players have already been victorious at the VELUX EHF FINAL4: Laszlo Nagy, Cristian Ugalde (both Barcelona 2011), Momir Ilic (Kiel 2010 and 2012) and Andreas Nilsson (Hamburg 2013).